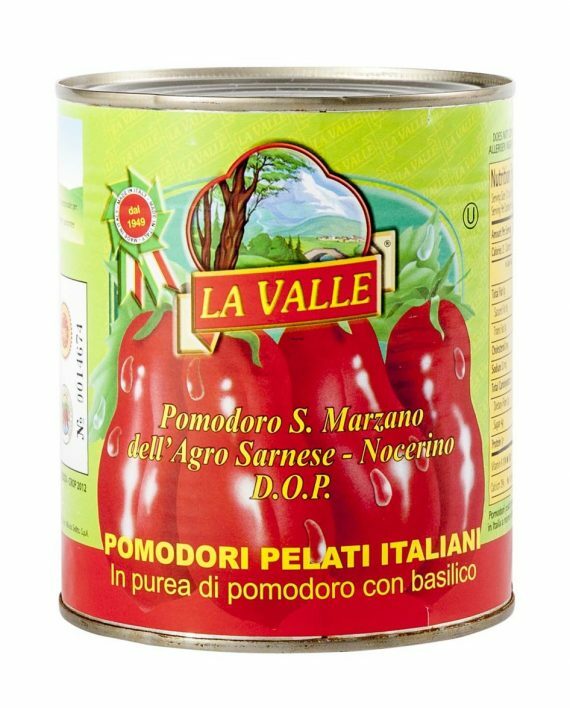 Home > Tomatoes and Pasta Sauces > La Valle San Marzano Peeled Tomatoes D.O.P. 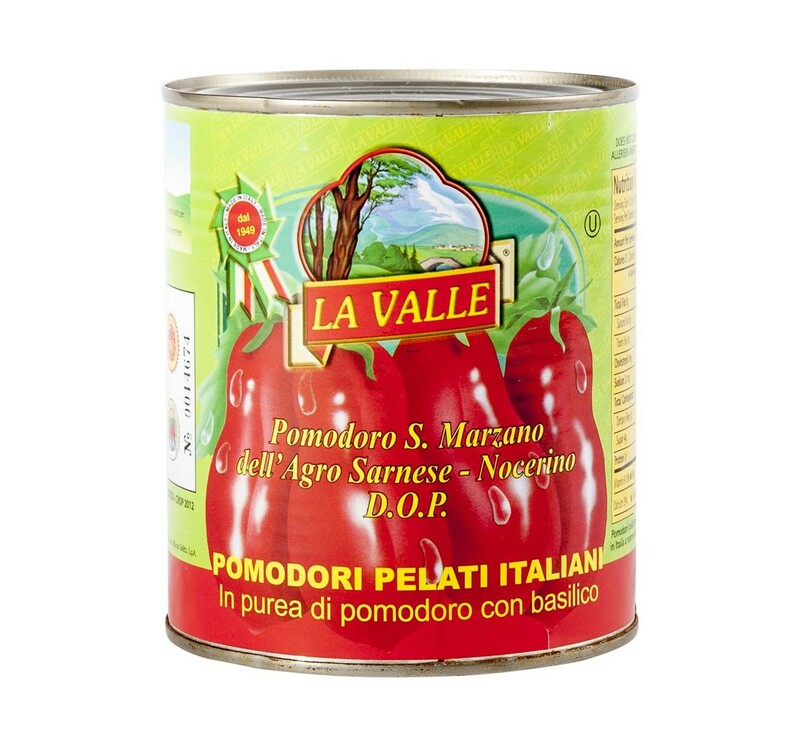 La Valle San Marzano Peeled Tomatoes D.O.P. San Marzano tomatoes are cultivated predominantly in the Agro Nocerino Sarnese region and are known and appreciated throughout the world for their unique characteristics. The tomatoes are grown much like grapes and are picked three or four times per year between July and September. Leftover matter from the nearby Vesuvius volcano's past eruptions makes the ground of Agro Nocerino-Sarnese especially fertile and gives the tomatoes a unique and authentic taste that can not be reproduced elsewhere. Considered by many chefs to be the best sauce tomatoes in the world because of their high quality and origins near Naples, San Marzano tomatoes have been designated as the only tomatoes that can be used for Vera Pizza Napoletana (US) - True Neapolitan Pizza. The name denotes both a point of origin and a variety of tomato. 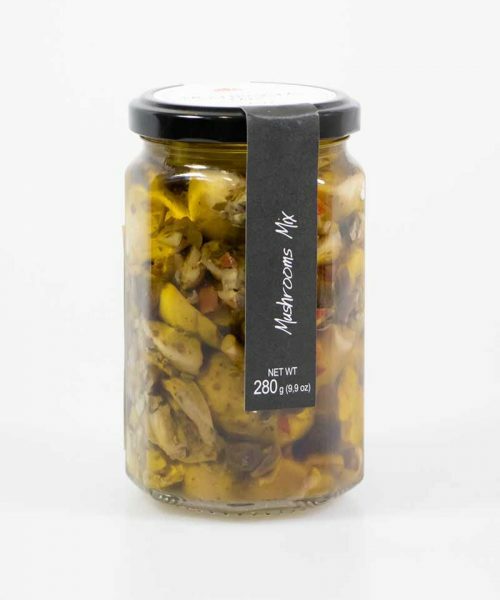 These canned Marzanos are grown in Italy in compliance with Italian law and have the EU "D.O.P." emblem on the label. The tomatoes have a typically sweet and sour taste, and a lively red color. The peel, at full maturity, is easily removable. These properties, along with the tomatoes' chemical and physical characteristics, render San Marzano tomatoes instantly recognizable. These tomatoes are extremely delicate and are handled with extreme care. 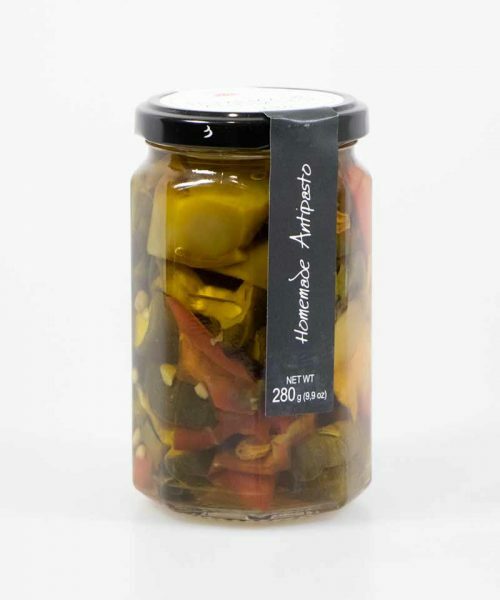 As soon as they are picked from the vines, they are rinsed and placed into cans, without any additives or preservatives. Considered by many chefs to be the best sauce tomatoes in the world because of their high quality and origins near Naples. Tomatoes have a typically sweet and sour taste, and a lively red color. San Marzano tomatoes are cultivated predominantly in the Agro Nocerino Sarnese region and are known and appreciated throughout the world for their unique characteristics. The tomatoes are grown much like grapes and are picked three or four times per year between July and September. Leftover matter from the nearby Vesuvius volcano’s past eruptions makes the ground of Agro Nocerino-Sarnese especially fertile and gives the tomatoes a unique and authentic taste that can not be reproduced elsewhere. Considered by many chefs to be the best sauce tomatoes in the world because of their high quality and origins near Naples, San Marzano tomatoes have been designated as the only tomatoes that can be used for Vera Pizza Napoletana (US) – True Neapolitan Pizza. The name denotes both a point of origin and a variety of tomato. These canned Marzanos are grown in Italy in compliance with Italian law and have the EU “D.O.P.” emblem on the label. The tomatoes have a typically sweet and sour taste, and a lively red color. The peel, at full maturity, is easily removable. These properties, along with the tomatoes’ chemical and physical characteristics, render San Marzano tomatoes instantly recognizable. These tomatoes are extremely delicate and are handled with extreme care. 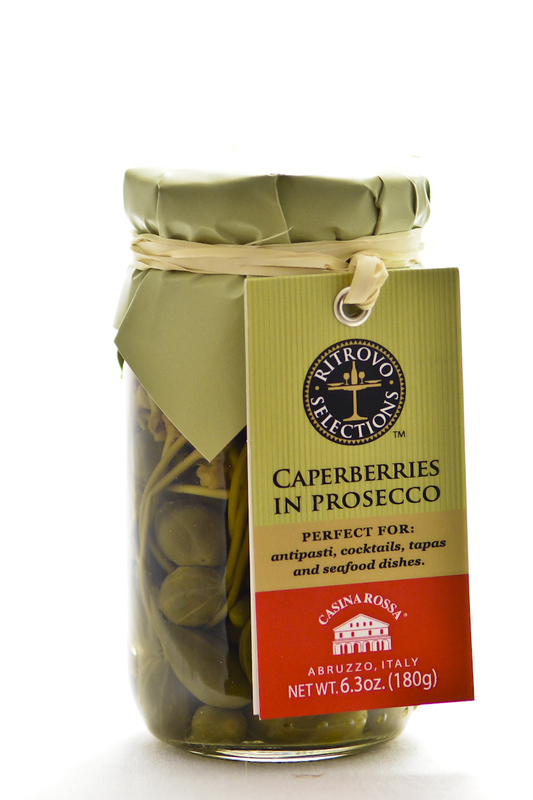 As soon as they are picked from the vines, they are rinsed and placed into cans, without any additives or preservatives.